I sent an e-mail out to our church choir and orchestra members a few minutes ago regarding some upcoming practice notes and schedule changes. I then went on to talk about choir stuff. My friend Jamie blogged today about family beach photos. In response, I offer a glimpse into how these pictures come into existence. It’s approx 3pm on a beautiful Florida afternoon. Picture a cute little family playing either on the beach or around the hotel pool when the wife says…. One of the biggest problems with taking pictures involving children is trying to get them to smile at the same time. We’ve learned that if you can get all the older kids in the picture to keep smiling, then hopefully you’ll be able to get just one shot of the littlest child smiling as well. If all goes well, you get a picture like this. This entry is what I've written for our church's monthly newsletter "The Builder". “Rock a Bye Baby, In the Tree top….” You’ve heard that song before, right? If you’re a parent, it’s possible that you’ve sung it. I’ve never been a fan of that lullaby. I can remember even as a kid listening to the soothing sounds of my mother singing that song and thinking... “Yeah that would be nice. Sitting in a tree, feeling the wind softly rocking me back and forth, very comforting, but then… Wait! what? The limb is breaking? and Woah, I’m Falling!! !” What's up with that?!? So, because I’m not a fan of the way that song ends, I chose different songs to sing to my kids. For Ethan, our song was always the theme to “Gilligan’s Island”. It may not seem like a great lullaby. But it worked well for us. 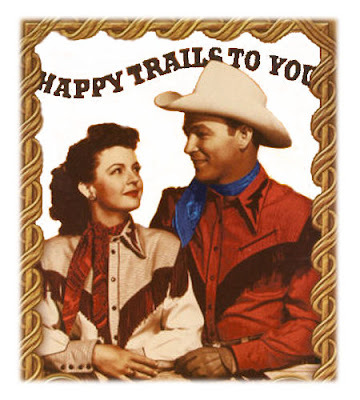 For Gavin, I’ve always sung the old Roy Rogers tune “Happy Trails”. 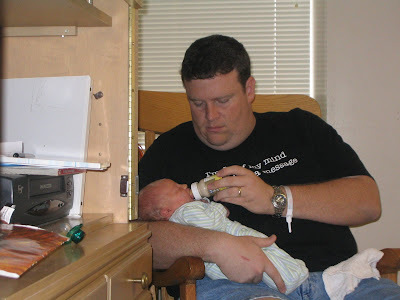 Now Ethan is 5 yrs old, so his days of climbing in Daddy’s lap to be rocked to sleep are gone. But Gavin (3 yrs) on the other hand, still loves to rock to sleep and he’ll even ask me to sing to him from time to time. But never, not even once, have either of my kids been willing to sing to me when I’ve asked them to. Maybe it’s because they don’t like to sing, or maybe they just don’t feel like they have the ability. I’m not sure. Well, this happened a couple days ago and it made me think about my relationship with God. Too many times I’ve expected him to be there to comfort me , to take care of my needs, or maybe even to “sing over me” (Zeph 3:17). But how often am I willing to do the things he wants me to do. And I’m not even talking about singing. “What, God? You want me to share my faith with this stranger?” “You want me to spend how much of my free time working with a ministry at church”. I’m sure we’ve all experienced times when God has asked us to do something and we felt uncomfortable, unskilled, or inadequate for the task. But, do you think that God would lead you to do anything that he didn’t think you could handle? I’d never force my kids to sing for me. It’s just something I’d like them to see them try one day. I think they’d enjoy singing if they tried it. I wonder if God feels the same way about the things he’s trying to get us to do for Him. The Movie’s Over. It’s 4 O’Clock And We're In Trouble, Deep. Have I ever mentioned that I like watching movies? So now I'm wondering what has changed. Is little Shawny growing up and getting more mature? Are my fatherly instincts taking over and making me think of these victims as people and not just idiots to be laughed at? (I was especially shaken by young Michael Myers in Halloween. I couldn't help but feel bad for him and think of him as a child who needed better parenting.) Or is it possible that I'm simply no longer entertained by images of actors being murdered on screen? I'm not sure of the answer, but I do know this. I don't think I'll be watching "Saw V" or "Halloween 2" anytime soon. I think I'll stick with comedies and action movies for now. This entry is part of the Sunday Setlist blogs at Fred McKinnon's website. I encourage you to check it out. Whether your a worship leader or not, it's interesting to see what other churches are doing in their services. This week, I purposefully stuck with some more traditional, more familiar songs. Even the "newer" songs (Tomlin's Forever & Famous One) are ones that we've been doing at Westwood for at least 5 years. We've been doing a lot of new music lately, whether it's been through new songs or new arrangements of older songs. I decided a few weeks ago that it might be time to simply utilize some songs that more people would be more familiar with. I was very glad I did. Sunday morning, we found out that my father in law was going to be at church with us. My family, with my wife's sister's family, and my Mother in law have been members of the same church for years. But my Father in law hasn't been in a church service for over 20 years. I gotta admit, I felt a real rush, a real feeling of the joy that only God can bring when I saw him sitting with my Mother in law in the sanctuary that morning. He is a man that I truly admire. He always puts his family's needs above his own. He's a very disciplined and hard working man. And he's very intelligent. I won't go into the whole history here, but I will say he knows a lot of scripture and always felt it was important for his family to be in church, but it's just something he hasn't done with them. Until this week. As we sang through the two hymns that I had planned in a row (which normally doesn't happen on Sunday mornings) I remember him sitting in the audience and I realized that it was possible those might be the only two songs we were doing that he'd ever heard before. I am so thankful that God led me to plan the service this way, not just because of my Father in law, but because of the many raised hands in worship that I saw during almost every song. But I will admit, it was interesting to see those expressions of worship from different age groups depending on the song. Today is Gavin's 3rd birthday. Gavin is my youngest son. I'd like to tell you a little about him (plus I am writing some of these things down so I remember them later. ) Right now, he enjoys wrestling, playing with Bakugan & Transformer toys, and in general doing whatever his older brother Ethan is doing. His favorite movies are Spy Kids: 2 & 3. But we do watch a lot of recorded "Justice League" shows too. His favorite phrase is "Uh... Hmmm?" Example:"Gavin, do you have a dirty diaper?" His answer.. "Uh ....... Hmmmm?" He'll use it alot when he either doesn't know the answer, or doesn't want to tell you the answer. He can count to ten, recognizes some letters, and has used the potty once. (But we're really working on that last one.) He hates confrontation. His answer to any stressful situation is to cry. When you ask him why he's crying he'll blame it on some old scrape he got on his knee weeks ago. (I know a certain daddy, that used to do that as a child too.) He is a cuddler and will gladly give his Mommy AND DADDY a kiss. I am so thankful God has allowed me the privilege of being his Daddy. Happy Birthday G-Money. I love you. This entry is part of the “blog carnival” going on at Fred McKinnon’s site. You should check it out and submit an entry about your Sunday service whether you were a leader or an attender. Here’s our list from this past Sunday with comments to follow. Down At The Cross - Hymn, done with a southern, off-beat feel. God of This City - 2nd Time we’ve done this one. I could see a real difference in those who worshipped and those who just thought it was yet another repetitive chorus. Sunday was part of Independence Day Weekend. We have an AM service followed by a festival in the evening with fireworks, bouncy thing for the kids, and lots of food and music. There were a bunch of conversations going on online last week about the use of patriotic songs in worship services. For our church I felt it would be best to include some of those elements as part of our worship. While I understand the argument that the worship hour should be used for only worship related things, we do spend time telling jokes or making announcements. And those things are not necessarily strictly worshipful. So I don’t feel that it’s inappropriate to recite the pledge of allegiance to our flag which is a symbol of our “One Nation Under God.” Plus we have many Veterans in our mostly senior adult congregation, so it was a worshipful service to some of them. I’ve mentioned before that we strive to have a blended service. This often means that no one is completely happy with the music. This was evidenced by the comments I heard about Sunday morning’s service…. - Someone rolling their eyes - Seen while singing the traditional hymn “Down At The Cross” . From 30-something female. - “That was a perfect choice of songs. I really worshipped today. Thanks.” From a 40-something female. - “I was with a group of ladies who were complaining that we don’t do any Baptist Hymns like we grew up with anymore. I asked them if any of them had talked to you about it. They said they didn’t feel comfortable doing so. So, I told them I’d talk to you.” From a 70-something female. So here’s my thought on this, and I have to quote the great Bill Cosby…. I think I'm just going to keep doing what I feel God is telling me to do.